You’ve seen them, those Australian kangaroos balanced on their tails, duking it out. 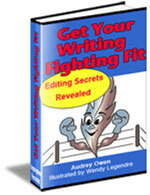 The uber self-publisher uses The Long Tail to deliver a 1, 2, 3, knockout punch! I promised to tell you what I thought Ellen could do to take advantage of The Long Tail related to her book on accessible places on the Sunshine Coast. Note that these punches are not in any particular order. You could effectively start with a Web site or with a hard copy book. Starting with an e-book would not, in my opinion, be effective because the marketing would have nothing to stand on. My personal choice would be to start with the Web site. The Web site can start earning money before it is finished. It is also in place to advertise the book when the book comes out. Spiders and search engines can be slow to recognize a new site, so some lead time is wise. But since you are more familiar with books and Ellen already has her book, I'll start there. Ellen has already done this. Most of you reading this have probably already published a book, or you have one ready to go, or you have one in your mind. The book can be about anything at all. Even fiction would work at this point, although I don’t recommend starting with a self-published work of fiction. It's just too hard to target that market well. Ellen is already selling her book locally. She has a plan and help implementing her plan to make everyone in her target community aware of her book. This is good. Well, even Amazon might capture a few more sales for her, although my guess would be that the local nature of the book means the market share from Amazon will be very low. Ellen would have to decide if it is worth her while to provide Amazon with the minimum number of books they require. Ellen can certainly use the same topic to create two more great punches. Ellen has had mobility issues for years. She knows the topic from the inside out. Not only does she have her own experience, she knows others who struggle as she does. I would suggest that Ellen begin her brainstorming around the words accessibility and mobility. Since I haven’t done this, I can’t say exactly what theme her site will finally be about. Remember my experience in creating my second site? It must be something people actually search for. It must also be something Ellen knows and cares about. She does, after all, have to write those pages. As an author, she will have credibility when she launches her Web site. In fact, new editions of her book should have her URL in them and on them. Ellen can write. She’s proven that with her book. She can use her celebrity, even though it’s local, to attract some advertising to her Web site. There are many possible streams of income from a Web site. In Ellen’s case this is even more important than it will be for many others. Ellen is easily tired, and promoting her book physically takes a toll. Her Web site, on the other hand, requires no travel, no meetings, no anything beyond writing and some simple management. Once Ellen’s Web site is earning her a profit, she can deliver the third punch. Ellen can’t just turn her current book into an e-book. It wouldn’t make sense for a book with such a local market. She can, however, write completely new material in the form of an e-book. Perhaps she can write about how to prepare for a guest who has mobility issues. Or maybe she can write about how to lobby the government for better accessibility. There are many issues around mobility and accessibility. Ellen was a travel agent. She could write the world travel guide for people with mobility problems. . . which cities to avoid and which to stay in longer. The point is that there’s a great deal of benefit to having a whole publishing package. Ellen, whose idea was to publish a small book for local people who have trouble getting around, could take advantage of The Long Tail to build multiple income streams. The Long Tail can give her long term income. Which of your projects will take advantage of The Long Tail? A smart man is developing the technology to turn a Web site into a hard copy book. If you want to know when he’s ready to launch, sign up for my newsletter, Editor’s Notes, or the RSS feed in the box under the buttons on the left of this page. This will add another bit to The Long (and growing) Tail available to self-publishers.